Rivers continue to swell in the Ohio and Mississippi Valleys. More than 10 inches of rain fell last week in Arkansas and Louisiana. 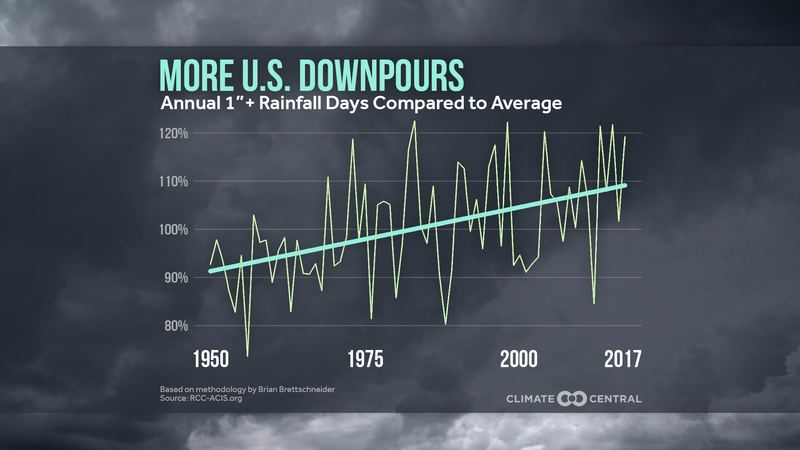 While the individual weather pattern may allow for heavy rain, the heaviest of this precipitation is increasing as the world warms from climate change. 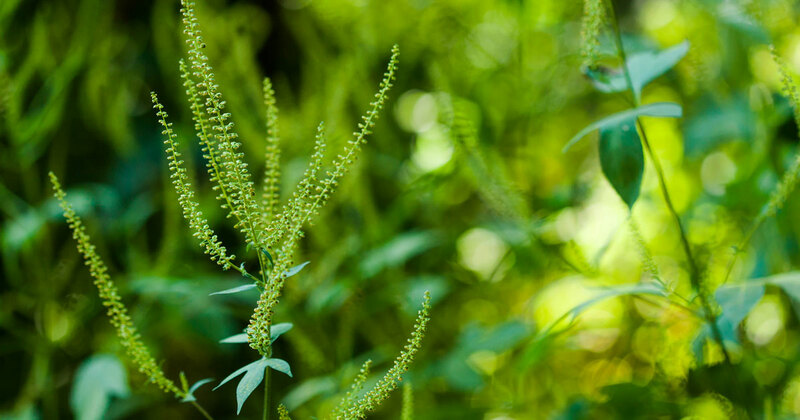 A warmer world supercharges the water cycle, leading to heavier precipitation. 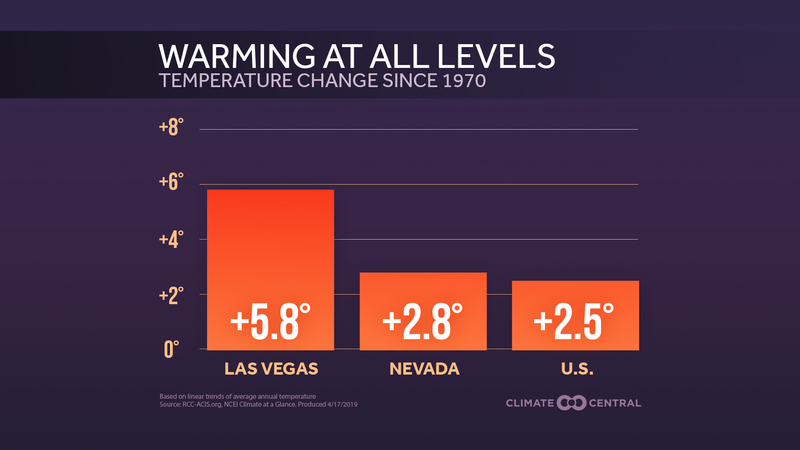 To start, a warmer atmosphere creates more evaporation — for every 1°F of warming, the saturation level is increased by about four percent. With more water evaporating into the atmosphere, there is more available to condense into precipitation, and it’s coming down in bigger downpours. 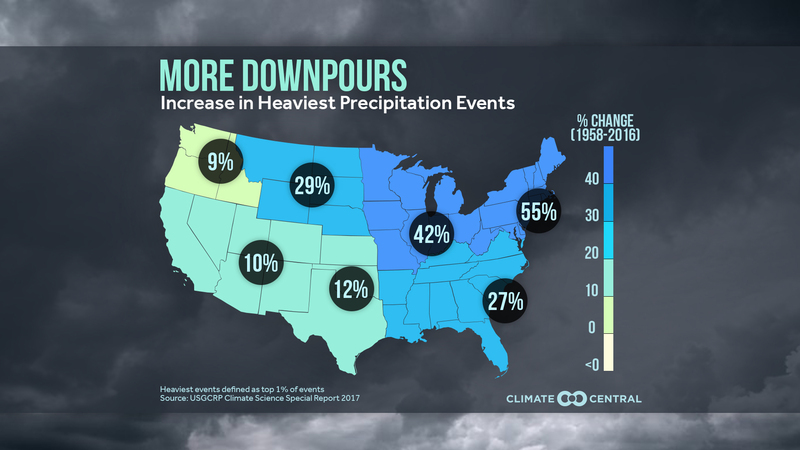 The national map shows where this change has been the most dramatic, indicating that the precipitation in the heaviest one percent of rainfall days is getting heavier. Science has attributed heavy rain to climate change for decades, but now we can analyze the role of climate change in individual extreme rainfall events. An analysis from our World Weather Attribution team indicated the rain from Hurricane Harvey over Texas was about three times more likely and 15 percent more intense from climate change. Another WWA analysis found that the Louisiana deluge of August 2016 was about 10 percent heavier because of climate change. The nationwide trends of days with one-, two-, and three-inch rainfalls are also increasing. For each year in the analysis, we examined the number of days that exceed those thresholds and compared it to the long-term average. We used three different thresholds to account for variations in regional climates. For example, a one-inch rain is unusual in Phoenix, but not in Miami. Even in the absence of urban development where there is more rain runoff, heavy rain will lead to more flooding. This means extreme flooding will become more common, resulting in more property damage. Over time, flood maps may have to be redrawn, which will have an impact on property values and insurance rates. Damage from the 2016 Louisiana floods was $10.4 billion and totaled $125 billion from Harvey. 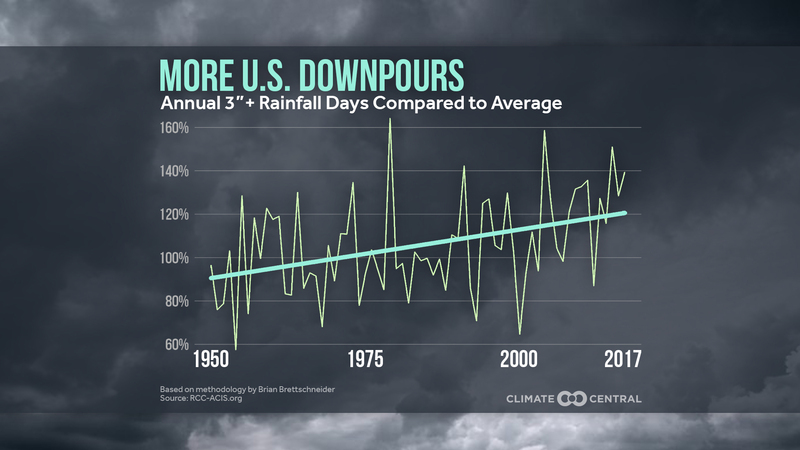 Methodology: Trends in one-, two-, and three-inch rainfall analyses are based on a methodology from Brian Brettschneider, a climate researcher at the University of Alaska Fairbanks. Regional increases in heavy rain are from the 2017 U.S. 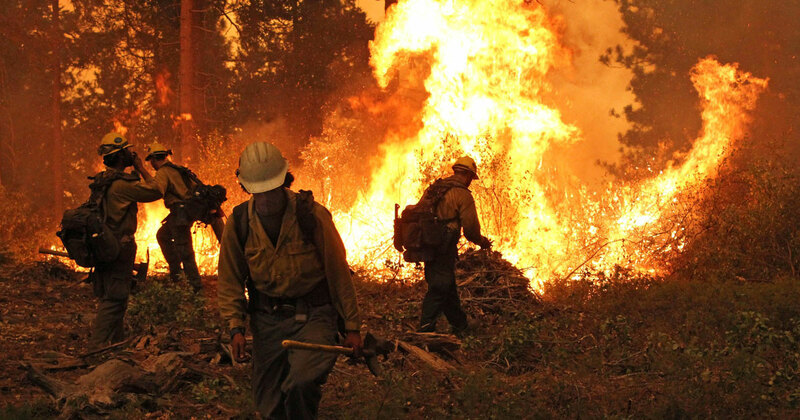 Climate Science Special Report.